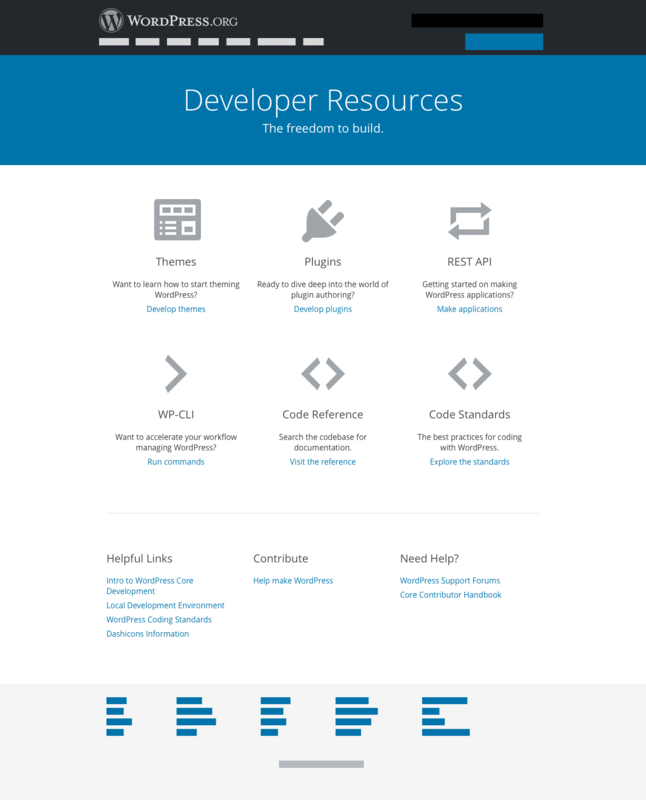 WordPress' Coding Standards are not just for Core, plugins, and themes use them, as does the upcoming Tide project, by moving the Coding Standards to a dedicated section on DevHub this allows the plugin and theme handbooks to also link to and reference this documentation. Previously in #2968 DevHub was updated to support the importing of the REST API docs from GitHub, the patche/s in this ticket build on the changes introduced in that ticket. meta-3377.patch​ (3.2 KB) - added by netweb 16 months ago. meta-3377.png​ (112.6 KB) - added by netweb 16 months ago. meta-3377.2.patch​ (3.2 KB) - added by netweb 16 months ago. code-standards.svg​ (1.2 KB) - added by EmpireOfLight 15 months ago. Patch meta-3377.patch SVN copies the /inc/rest-api.php file added in  to inc/coding-standards.php with the proprosed changes for this ticket. A patch should be added for this by adding to the appropriate section to ​/wporg-developer/page-home-landing.php once a design has been finalised. I think the file reference in functions.php needs updating to coding-standards.php. Adding subsections that way doesn't seem very scalable. @mapk Do you have thoughts on how best to accommodate new sections?? While we're working on this page, it might be a good time to implement some of the new design styles if possible. Is this something we can do? Do the two "Coding" modules need to be styled differently than the others? If so, why? Are these all the accepted icons that represent each category? I haven't changed them from the original, but I always thought "themes" was the paintbrush. Should each of these icons match what's being displayed on ​https://make.wordpress.org/ ? I'd agree with the icons matching those on make.wordpress.org where possible. The Code Reference being the <> makes sense, since that's code reference about Core (which has <> icon on make.wordpress.org). I'd like to see the Code Standards have its own icon. Since they are code standards for the whole community (Plugins, Themes and Core), I don't think having the same icon as just Core (<>) makes sense. Also, the angular brackets tend to be delimiters in HTML, but the current CS is more about PHP, and to a lesser extent, JS and CSS. As yet, there is no dashicon specifically marked as representing CS/WPCS. I'd like to see the Code Standards have its own icon. There's a Design meeting today, I'll add it to the agenda. Maybe we can get one made. @mapk brought this up in our design meeting today... I am currently editing dashicons and will gladly create the Code Standards icon. @GaryJ - do you want to reach out to me to articulate what works best? This ticket was mentioned in ​Slack in #core-coding-standards by garyj. ​View the logs. Just attached the design @cathibosco1 created and posted on the #dashicons-design slack channel. I'll add it to the dashicons for 5.0 list unless anyone has comments. This ticket was mentioned in ​Slack in #design-dashicons by cathibosco. ​View the logs. This ticket was mentioned in ​Slack in #docs by coffee2code. ​View the logs. developer.wordpress.org: Revamp the design of the homepage to match the redesign of other wp.org sites (support, plugins, main, etc). Also changes dashicon used for theme handbook.